Swiss rolling stock producer Stadler will supply four three-car diesel trains to Italian railway operator Ferrovie Appulo Lucane (FAL). 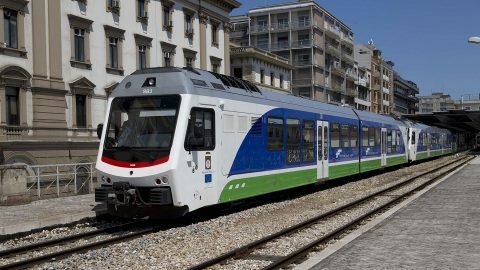 The vehicles will serve the 950-millimetre narrow-gauge routes in Apulia and Basilicata regions. The units worth 22.8 million Euros will be delivered within 24 months. Stadler also has an option for the delivery of four additional trains. The ordered trainsets have 50 per cent of low-floor space for improved access. They are airconditioned units and equipped with special toilet for disabled passengers. The 52.5-meter trains have a total capacity of 306 passengers and a seating capacity for 154 passengers. The car bodies are made of lightweight aluminium composite construction. Stadler has been cooperating with FAL since 2011 when the parties concluded the first agreement. With the new order, the Italian operator increases the number of new narrow-gauge trains supplied by a Swiss company to 23 units. Most of them were delivered in 2012-2014. The modern FAL fleet consists of two types: SB units with a total capacity of 200 passengers and ST units that are capable of carrying 300 passengers. Stadler also supplied narrow-gauge trains to Sardinian transport operator ARST.